Classic Car Events is the organizer of the world's most remarkable long-distance rallies for classic cars. Guaranteed the most smiles per mile! three profiles were found for Classicevents.nl in social networks. Among other social networks the website is represented in Facebook, Twitter and YouTube. 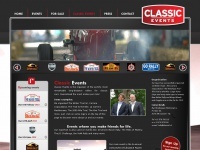 The web server used by Classicevents.nl is run by PCextreme B.V. and located in Netherlands. This web server runs 6 other websites, their language is mostly english. A Nginx server hosts the websites of Classicevents.nl. The website uses the latest markup standard HTML 5. Indexing the data of the website and following hyperlinks on it is explicitly allowed by robot information. The visitors are redirected to the homepage of the website "/classic-car-events".